This year marks the seventh anniversary of Bike Hub. 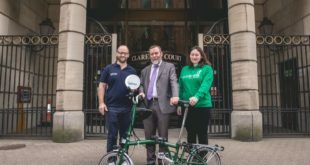 In his speech in the House of Commons in March, Transport Minister Norman Baker expressed his appreciation to the cycle industry for their continuing support for initiatives to promote safe cycling, especially to young people, through Bike Hub. He singled out Bike It, The Big Pedal, and the Bike Hub app for special mention. So how successful has Bike Hub been? Contributions in 2011 have exceeded £400,000 (£404,993). The final quarter of the year was particularly encouraging with a total of £120,300. In three out of the four last calendar years, contributions have topped £400,000; at £439,000 in 2008 – £434,000 in 2009 and £376,000 in 2010. Poor weather inevitably depresses retail sales, meaning a stock build-up with distributors, and hence a slacking of new orders to suppliers. So the dip in contributions in the year 2010 is in part offset by the increase at the start of 2011. Whichever way you look at it, the cycle industry has donated over £3million, mainly to schemes to get a new generation riding bikes. The figures are all the more remarkable since there are few of the biggest retailers engaged; not Halfords; not Wiggle or Chain Reaction. The supermarkets are not contributing, nor the mail-order or internet suppliers. It’s all the more credit to the famous cycle brands, Specialized, Giant, Trek among them, and wholesalers like Fisher Outdoor Leisure – and the hundreds of independent dealers who have really made the Bike Hub idea work. At just £1 for every £1,000 of purchases, the achievement in total is truly remarkable – and it’s unique to the UK. It’s the only market where suppliers and retailers work together, and continue together, ‘to safeguard the future of cycling’. In 2011, Bike Hub once again invested the majority of its contributions with Sustrans, the national cycling and walking charity. Inevitably, since contributions fluctuate quarter-by-quarter – and who knows if the retail market will grow in 2012? – it is appropriate to be cautious in the forward allocation of funds, especially since most of our projects are reliant on people, and so cannot be terminated at short notice without having a serious impact on employment. So far the programme for 2012 has committed £200,000 to Bike It with Sustrans; £40,000 also to Sustrans for the Big Pedal, and £30,000 for Samsung Bike Week which began on June 16th (with the MPs’ Bike Ride as the ‘trailer’ on June 12th in London). The bicycle industry is also the prime sponsor of the ‘Summer of Cycling’ in 2012, which has the All Party Parliamentary Cycling Group as its patrons. Bike Hub has given a tremendous boost to a range of activities, particularly focused on young people, the cyclists of the future. The contributions, and the enduring support for Bike Hub, are a tribute to the commitment of hundreds of small businesses across the UK to their vision of cycling for years to come. Their achievements, and the backing of the major brands, have demonstrated that great schemes can be created with individually modest contributions: £1 for every £1,000 of purchases has generated over £3 million so far. The message is simple: Bike Hub works; it works well; and it gets results. So please just keep doing it. If you are interested in supporting Bike Hub please contact office@ba-gb.com or call 02476 553838.